They see us rolling, they hatin’. Otakus out in the sunlight?! What is going on with the world. Yes we are an active club, and yes we do go out. So scroll down and read about our adventures. Thanks to all who attended the End of Semester Dinner yesterday! 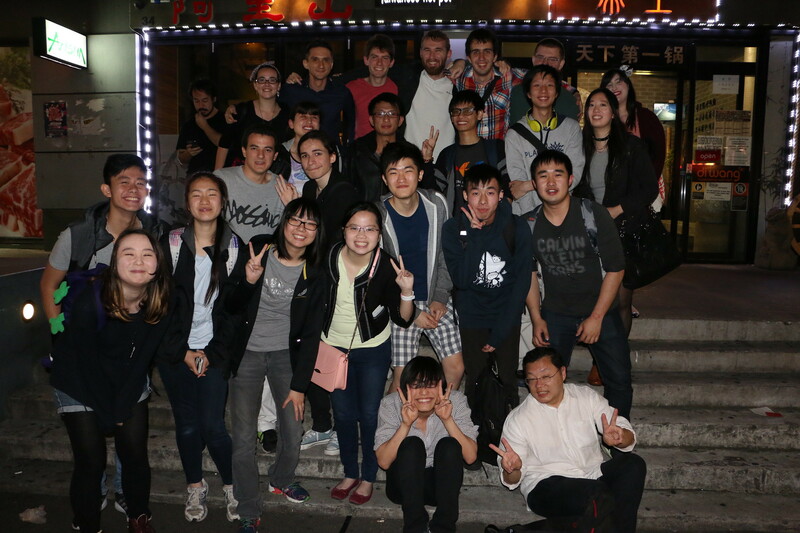 We hope you guys enjoyed the night as well as the food at Di Wang, especially to those who’ve never had hotpot before, it was out little treat. It would be amazing to see you all again at the AnimeSydney Christmas Party! and if you haven’t bought a ticket already, contact your nearest UTSanime exec ;D or text: 0420579399. The party is only a 2 weeks away so you better get them soon! And don’t forget, they are $15 now, but will be $25 at the door, so don’t leave it till the last minute. Photos of the dinner can be found on our club Flickr. The Night Noodle Markets is an annual event held at Hyde Park, where people can try noodles, fried chicken, dumplings, corn on a stick and many more unique asian foods. As a club with deep interested in asian culture, we could not not go! Assignments due? Exams coming up? Pffft – Night Noodle Markets are on! Accompanied by JASS, we went out to experience some good asian cuisine (and beer), just like back in 2013. Good (but overpriced) food, great atmosphere, amazing people, what more would you possible want. Thank you all for coming, and those who didn’t – you guys missed out. Next up we got Halloween, JFF, Matsuri and Xmas Party! Hope to see you all there. PS: You should buy some Xmas party tickets from us. This is Adasifs speaking. Whoop, whoop, whoop, we’ve had a lot of events going on this year! Didn’t get to attend one? Here’s a video recap of all the events held before the 2014 AGM! Thanks for joining us at our events! Weekly events are now back on track, starting with todays Main Screening and special dinner. Since we are a club which is focused on exploring asian culture (mainly Japanese of course) we couldn’t miss out on this opportunity to try some good noodles! 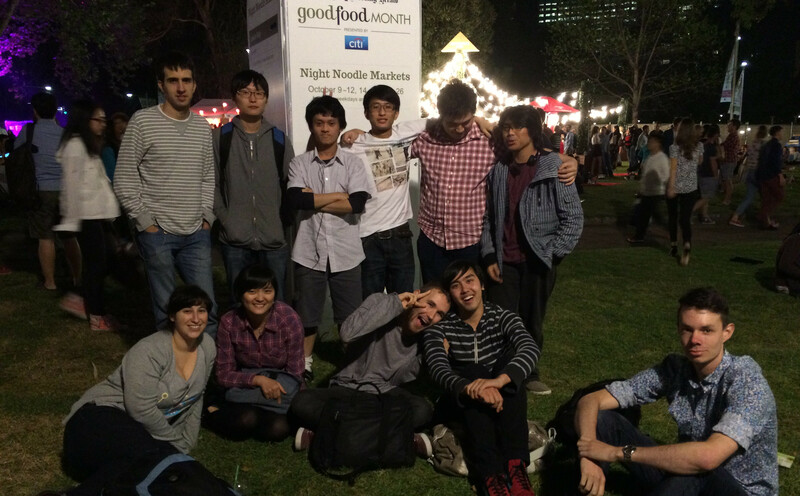 It is Good Food Month with the annual Night Noodle Markets in Hyde Park. Although the prices could be steep, for example a single plate of noodles at one stall was $12, and the quality was passable but nothing special. Others who chose rice meals or chicken seemed pleased with what they got, and then there was Baek who stood in line for 15 minutes to get some dumplings. It was the company that mattered in the end and we all had a blast. It was a pleasant great change of scene and it was nice to see the strings of lights brightening up the night sky. PS: Come to screenings, come to dinners, lets enjoy our rose-colored campus life together! (10 points to anyone who can get that reference). After one of our staple karaoke events, we decided to continue to expand our places of food consumption to include a restaurant on Sussex St called Home Thai. One of our members had walked past the restaurant many times before, and every time there was a queue of people outside. Using our powers of deduction, we thought that that could mean that this restaurant was pretty good.